Medipedia 2nd ICO phase to start from 12th November. Here’s all you need to know! For Medipedia team the successful conclusion of its 1st ICOsale has brought a mixed bag of excitement and relief at the same time. There are few things sweeter than a fairly won battle and a successful ICO definitely comes close to that. 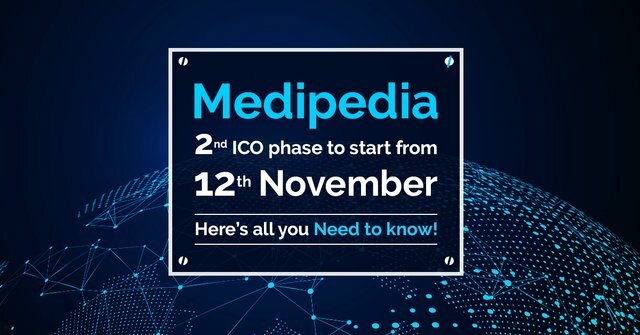 But Medipedia would restrain from indulging in pre-celebration and rather focus on the next important task in hand i.e the ICO if not equal is similar 2nd ICO phase which starts from 12th November with 5% Bonus! A successful ICO is just one among the many milestones that make up the demanding journey of a successful blockchain project. In this blog, we take time to share with Mediapedia ICO participants, investors and blockchain enthusiasts the details of the 1st ICO sale as well as throw light on the benefits and offers that participants of the 2nd Medipedia ICO get. Crowdsale 2nd Round: 12th November 2018 with 5% Bonus! Medipedia is a blockchain enterprise offering transparent and cost-effective medical tourism for healthcare service providers and patients alike free of any centralized authority or middlemen. For more on ICO Details and Use of Funds, please visit https://medipedia.io/ or download whitepaper at https://medipedia.io/whitepaper/whitepaper_en.pdf.